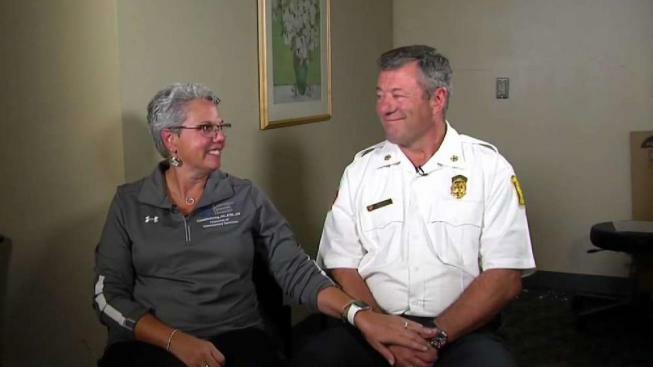 Lawrence Fire Chief Brian Moriarty and his wife, Kim Moriarty, the director of emergency services at Lawrence General Hospital, both led first responders during the rash of gas fires and explosions in Merrimack Valley. As the Merrimack Valley continues recovering and rebuilding, first responders are recounting what they went through to keep their communities safe. In Lawrence, Massachusetts, a husband and wife had a big hand in the effort. Brian and Kim Moriarty did not see each other for four days following the incident. He is the fire chief in Lawrence and she is the director of emergency services at Lawrence General Hospital. "I think it was the biggest event where we were both running at the same time," Kim Moriarty said. "I knew he was running this humongous effort in Lawrence around the fires and explosions and we were running the hospital, preparing to take victims." While running on generator power, she and her team helped treat 13 patients that night. Two of them were critical. Moriarty said hospital employees came in from all over to help, even those who live in the affected area. "Then we heard about the explosion and it took on a whole new meaning," she said. "We were thinking, 'Oh my gosh, could there be more? How are we going to do this?'" She was relieved to hear through a friend that her husband was safe. At the time she was treating patients, Brian Moriarty was calling every firefighter in to put out every fire they had. "We had well over 100 calls," the chief said. "We had so many calls we couldn't even get them all into the computer right away. We fought a house fire with a pump and a ladder. Normally, that would be a 2-or-3-alarm fire." In the long days that followed, they communicated mostly via text message. Kim sent a few after seeing her husband on television. "I would tell him to smile more or to not look grumpy, just silly stuff because I knew he was stressed," Kim Moriarty said. Now that they are home, they said there is more appreciation than exhaustion, not just for each other, but for their entire community. Mutual aid came from all over that night. Food and donations continue to be dropped off at various departments as a way to say thanks. They both said they would not have been able to get through the incident without the support they received during it and they are forever grateful. "I'm proud of Lawrence," Kim Moriarty said. "I'm proud of the way people have stepped up to help." While it was not in their vows, the couple said protecting their city, for better or worse, is a promise they will always keep. "This is long-lasting for us," Brian Moriarty said. "But that's why we're here. We're here to help in any way we can."